Conclave note: We’re not going to publish every press release from a company looking to market its wares to our audience. 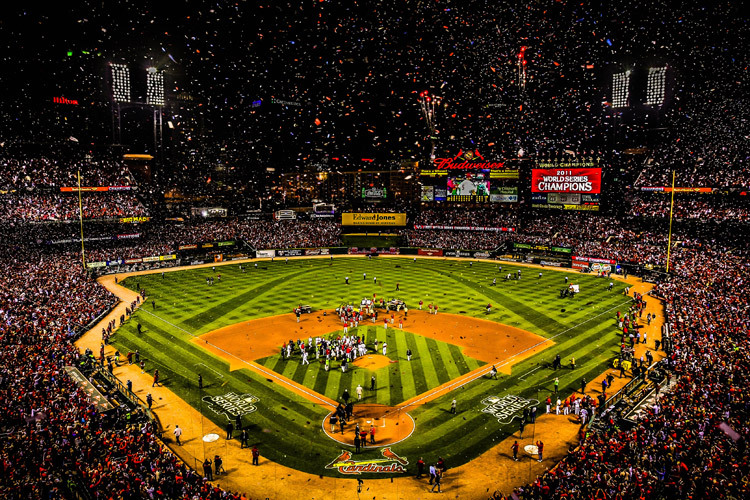 However, if there’s a product that catches our interest or is specific to Cardinal fans, we’ll put it up here. There are some very nice Cardinal pieces in this collection–examples below–and we thought our readers might find this worth knowing about. California, Jul. 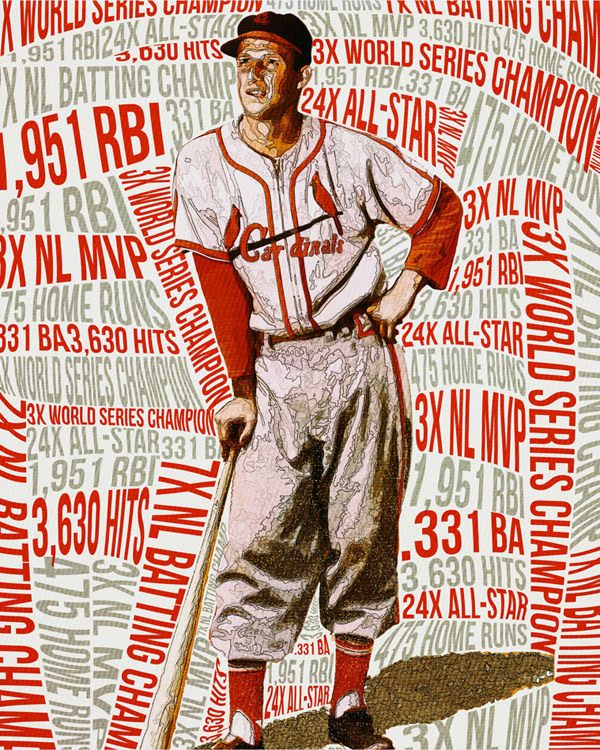 30, 2013 – RareInk today announced a new licensing agreement with Major League Baseball Properties and the Major League Baseball Players Association to offer fans a collection of cutting-edge, limited-edition artwork featuring MLB players past and present, historical moments and ballparks. 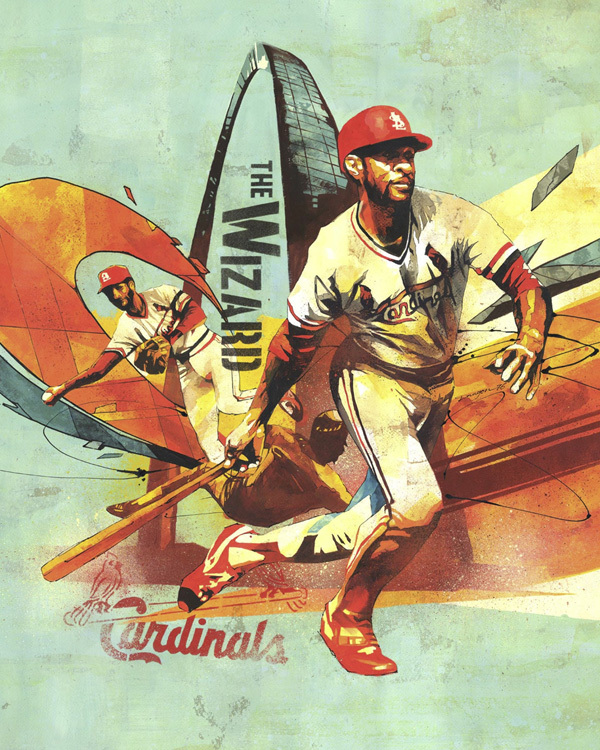 Available on RareInk.com, the collection features over 500 pieces of original and photo-based artwork of current MLB stars, members of the National Baseball Hall of Fame and iconic ballparks. The collection of officially licensed artwork includes modern art styles ranging from ultra-realism to street art to minimalism, with RareInk commissioning original works from internationally acclaimed artists. Highlights of the collection include art of: Mickey Mantle from his 1951 rookie season; Cal Ripken’s consecutive game record (Grzegorz Domaradzki, Poland); Stan Musial’s career accomplishments (Kerry Laster, Atlanta); the Giants® 2012 World Series® title (AJ Dimarucot, Phillipines); and all 30 current MLB ballparks recreated in minimalist form by UK artist Marcus Reed. Additional highlights include pieces featuring current big league stars Derek Jeter, Mariano Rivera, Miguel Cabrera, Yu Darvish, Buster Posey and David Ortiz. Each RareInk piece of art is produced using fine art, archival materials and is offered in three executions: fine art paper prints ($79 to $129); stretched canvases ($129 to $349); and metal prints on brushed aluminum ($399 to $419). Every piece is a hand-numbered, limited-edition, with edition sizes ranging from 50 to 250. The artwork is available for sale exclusively at RareInk.com. Based in Carlsbad, California, RareInk’s mission is to create extraordinary and accessible art for sports fans. “We all have strong, emotional connections with our favorite teams and players. RareInk brings sports to life with unique artwork allowing fans to bring their passion to the walls of their homes and offices,” says Tim Muret, CEO of RareInk.